I just recently read the book The Reflections Of Queen Snow White and wanted to share my review with you all. I think that we all have grown up with the fairy tale of Snow White, her friends the seven dwarfs and of course Prince Charming. I am sure we read the story in a the fairy tale books and have watched the movie version by Walt Disney. Those two versions leave us with Prince Charming and Snow White living happily ever after once the Prince kisses her back to life after having eaten the poisoned apple. For most of us that is where the story ends but what was their lives like after that life awakening kiss? 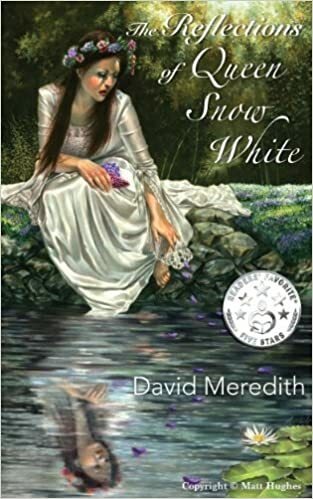 The author, David Meredith, has written an insightful tale of what life might have been like for Snow White after she marries Prince Charming. Mr. Meredith takes us to a realistic world of the woman Snow White that is not meant as a continuation of a child's fairy tale but more a story for adults to read. I am going to admit that there were parts of this book that were difficult for me to read, not because they were poorly written but because they touched a nerve in my soul. The original fairy tale only insinuates that the evil Queen mistreated dear Snow White but this book tells in realistic detail the abuse that the young Princess suffered under her step-mother's tutelage. The story shows us vividly the mistreatment and the scars left locked away in her mind many years after the abuse was over. It was hard to read but it was so very accurate in the damage done to one who has suffered abuse. One who has suffered from abuse recognizes the truth in the story. "Mirror, Mirror on the wall. Who is the fairest of them all?" Mr. Meredith writes this book with the premise that Snow White is depressed after her wonderful Prince Charming dies from old age. This isn't just the veiled suggestion of depression but a very accurate depiction of what deep disabling depression can be like. Having experienced the depths of depression myself, the author describes it very well which makes me think that he writes from what he knows. It is honest, heart wrenching and realistic. Depression isn't pretty, not even for a Queen but it is real and not portrayed often enough for people who haven't walked in those shoes to comprehend. The author did a fine job, even though it is hard to picture Snow White that overcome with despair. Depression knows no boundaries, it doesn't come to just one sector of a culture; it can touch any life from the poorest of souls to even a Queen. I referenced the mirror above that the evil Queen step-mother used. It is a huge part of this story. I don't want to give a lot away about the book so I will be careful about what I say from here. Suffice it to say, we can see a lot in the reflections of a mirror. If we look hard enough, we might even be able to see our soul, troubled as it might be. So far, I have painted a rather dark description of this book. It is dark in several places but life itself can be a dark and frightening place. This story needs to touch on the darker parts of a human's life in order to also show hope. There is hope or at least there should always be hope in one's life. Sometimes it may be hard for us to see a glimmer of hope but it is there; we just have to dig really deep to find it. The story is also about inner strength, something that many of us fail to see in ourselves. When we have suffered abuse, lost a loved one or any of the other things that life throws at us that causes us to fall into a deep depression; we feel that we are weak and can't possibly get through this dark journey. Are we strong enough to face those inner demons that torment our soul? Can we let go of the anger and bitterness we feel from the mistreatment, the feelings of abandonment when a loved one dies and heal the wounds of hurt? Can Queen Snow White? Does she have the strength to look in the mirror at herself? Will she find her happily ever after in a new way? We often gush over a book that was light and fun to read. This isn't a book that you will gush over but I can say that I liked it. It hurt to read some of it, it brought back some of my old demons or at least the memories of them. It also reminded me of the strength it took to overcome my own depression. It reminded me of hope. It made me stop and think about life and the souls who might be next to me who are battling their own demons. It reminded me that the answers are always within us; we just have to have the courage to look inside and deal with what we see. It is a story that will stay with me for a long time. It is real, it is a bit raw but most of all it has a good strong message about life and all of the hurts we can encounter and overcome if we choose to. An interesting book review, Bev. It makes one realize that there can be hidden problems even in what appears to be a Fairy Tale life. Bev, I am so glad you reviewed this book. Sometimes we do need the reminders that we, ourselves are strong enough to survive. We always need to be aware of the fact that there are people around us who are suffering and while we may not be able to see the physical scars, the pain is still there. We do tend to think that people with beauty, like Snow White, who are loved or have material possessions, don't feel pain or suffer in any way. We see only the outside facade. That is the difference between the fairy tale and reality. Very interesting concept for a book. The analogy is a good one, I think. I hope the book ends with Snow White dealing with the issues of her past and realizing that she's even more beautiful on the inside as she is on the outside, as we all can be under similar circumstances. And who doesn't have similar circumstances, to one degree or another? Excellent review, Bev. Thank you! Bev, your own history in relation to this book, and how you talked about it is powerful. This is a book that a few people in my life could relate to, and perhaps find the hope that you expressed here. Really great review. What an interesting and intriguing review. Thank you for sharing that it hit you personally. I think the best books are the ones that strike a chord with us. Definitely intriguing review that is tantalizing enough to want me to read the book. Depression is a topic not discussed enough so it seems to have a stigma and it shouldn't. Poor Snow White, I hope she got through it! Excellent Review. I'm not sure it's a book I can handle right now, but I'm definitely going to make note of it. The time is probably coming when I will want to read it. I like the twist about going past the "happily ever after ending" and into real life.